One should also note most carefully that from the words of this commandment [to love your neighbor as yourself] some of the fathers drew the opinion that the love here prescribed begins with oneself, because, as they say, love of oneself is prescribed as the rule according to which you should love your neighbor. I used to think about these things in an effort to understand them, but the exertion is useless. I shall not decide in advance for anyone but shall make bold to set forth my own opinion. I understand this commandment in the following way; It commends love only of one’s neighbor, not love of oneself. In the first place, because love of oneself is in everyone inherently. Secondly, because if Paul had meant this to be the sequence, he would have said: “You shall love yourself, and your neighbor as yourself,” that is, just as you already love yourself, without any commandment. But in 1 Cor. 13:5 the apostle Paul, too, ascribes this quality to love that it does not look for its own advantage, since it completely renounces love of oneself. Christ commands that one deny oneself and hate one’s own life (cf. Mark 8:34 f.). And Phil. 2:4 says clearly: “Let each of you look not only to his own interests but also to the interests of others.” Finally, if a man had the right kind of love of himself, he would no longer be in need of the grace of God, because the same love, if it is the right kind, loves both oneself and one’s neighbor, for this commandment demands the same love, not another love. But, as I have said, the commandment presupposes that a man loves himself. And when Christ says in Matt. 7:12: “Whatever you wish that men would do to you,” He is certainly declaring that affection and love of self are already present in them; and, as is obvious, He is not commanding it in this passage either. Therefore, as I have said, according to the opinion I make bold to have, the commandment seems to be speaking of the perverse love because of which everyone, forgetful of his neighbor, looks only to his own interests. This, on the other hand, becomes the right kind of love when one forgets oneself and serves only one’s neighbor. The members of the body also point this out, since every one of them serves the other at its own risk. For the hand fights in defense of the head and receives injuries for this; the feet sink in mud and water for the sake of saving the body. But when love observes such an arrangement – an arrangement which Christ, however, wanted to destroy utterly with this commandment – the desire for one’s own interests is fostered in an exceedingly dangerous manner. But if one must concede absolutely that love of oneself is ranked first here, I at least shall ascend to a higher level and say that love of this kind is always wrong so long as it is in itself, and that it is not good unless it is outside itself in God; that is, that with my affection for myself and my love of myself completely dead, I look for nothing but that God’s completely undefiled will be done in me. Then I am ready for death, for life, and for any form my potter wants to give me. This is arduous and very difficult, and for nature it is impossible. For in this case I am loving myself, not in myself but in God, not in my own will but in God’s will. And in this way I shall then also love my neighbor as myself, wishing and striving that only the will of God be done in him and that his own will be done in no way at all. But I do not think that they understood it in this way, nor does the commandment seem to be speaking of this love in particular. Therefore I want everyone to be warned to beware of heathen teachings like “You must be a neighbor to yourself” and similar ones. For these teachings are perverted. Besides, they are twisted contrary to the force of grammar; for “neighbor” is a word used only with reference to someone else. 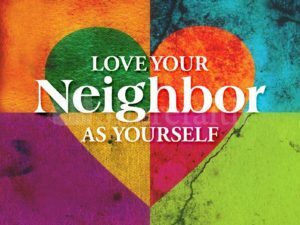 For this reason a Christian has to say: “You must be a neighbor to someone else,” as this commandment also indicates.